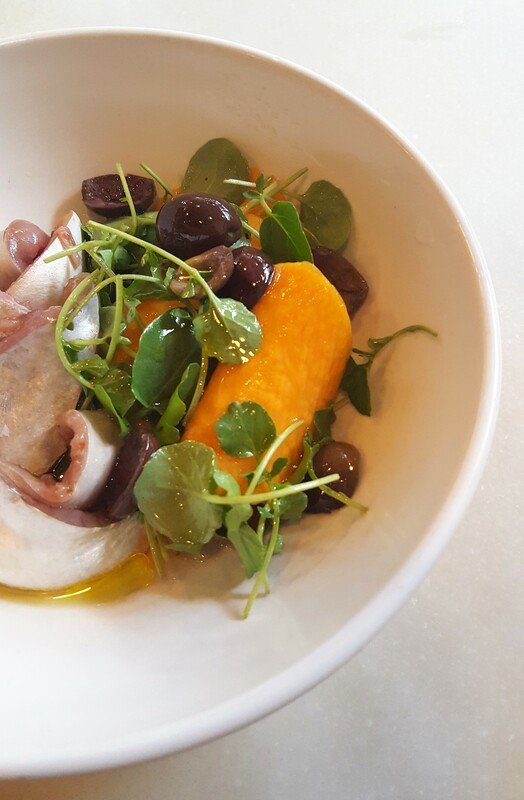 It’s impossible to forget the first time you taste Portuguese chef Nuno Mendes’ expressive food. For me, this was at A-list haunt Chiltern Firehouse once the parade of chauffeur-driven cars had almost disappeared, paparazzi were no longer camped outside and influencers had moved onto the next trendy opening. What I would like to forget, however, is the obnoxious service which somewhat sullied the experience. Thankfully, our dinner at Taberna do Mercado, Chef Mendes’ more informal outpost in Spitalfields, is the polar opposite. As you weave through the vibrant market stalls, a cacophony of sounds floating towards your ears, you dream of an oasis of calm. Then it appears: sleek white marbled tables and plain white walls, cool contrasts to the pockets of warmth from thin copper coils binding the loose menu pages and bottle-green leather seating. If these pale hues evoke Scandi chic, rest assured that the plates and their contents definitely illustrate bright and breezy Lisbon. Reimagined classics, the “blurred memories” of which Chef Mendes still recalls fondly, are the order of the day here. The call of carb-heavy comforts is strong, and we start with butter the colour of early evening sunshine slowly melting into thick, warm slices of wholewheat bread. 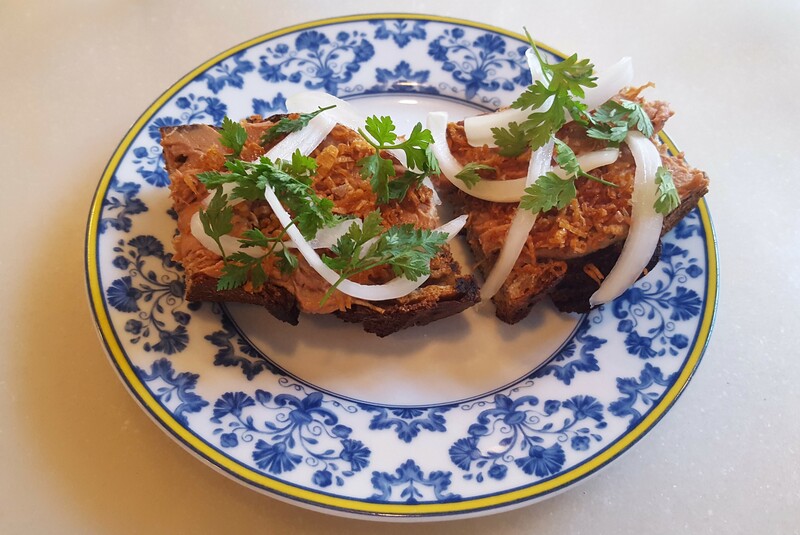 Toasted bread follows, its surface almost entirely concealed by luscious layers of chicken liver parfait, slivers of sharp white onions and a smattering of coriander leaves. Single-slice dishes then double up: the Portuguese sandwich aka bifana. Flat lays of this round beige affair won’t set Instagram ablaze, but I couldn’t care less when it tastes tangy and inspires dreams of travel. 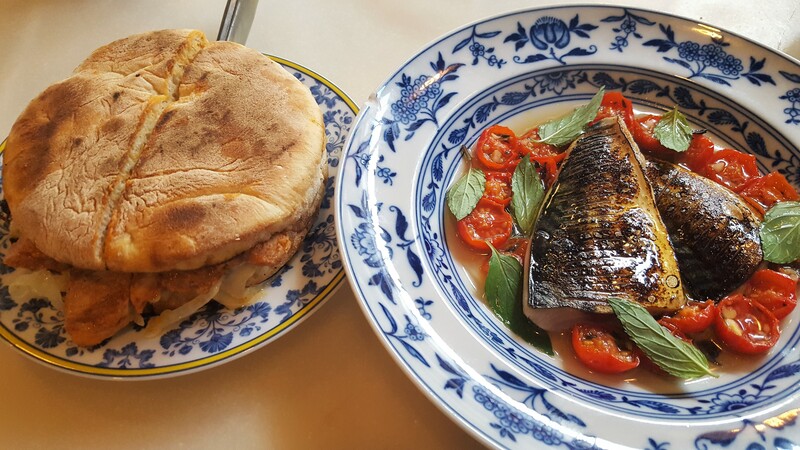 No Lisboeta table would be complete without coastal delights, mackerel in particular. These grilled fillets, their skins blistered until golden and served alongside crimson-red cherry tomatoes and basil leaves, are a nod to Portuguese patriotism. Bonito belly, enjoyed by Chef Savla (CS) for its distinct flavour, is less successful for me; the fish too fatty, the sugary melon and salty black olives doing little to temper the overwhelming taste. We brave one more pretty plate before reaching the inevitable conclusion for dessert. Why brave? 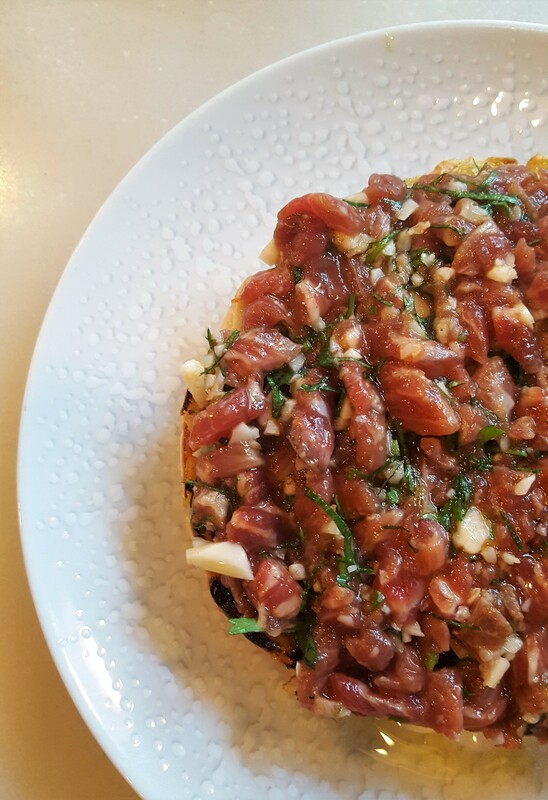 The dish is Ibérico pork presa tartare. The Savlas are no strangers to raw meat, yet this is novel. We wonder if it’s safe for consumption and are told the meat is immediately sealed then frozen for ten days before being defrosted, chopped, prepared and served. What a revelation: tender, fat-lined chunks of meat meet raw garlic shards meet punchy herbs. 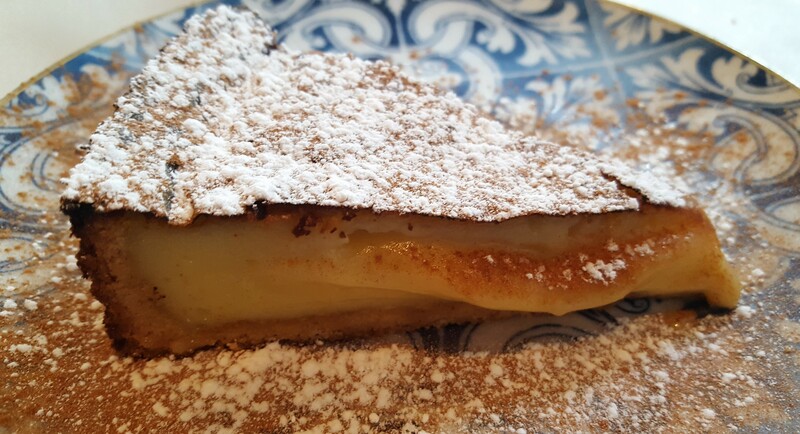 Leaving without trying the Taberna do Mercado take on the world-famous pastel de nata would be a crying shame; they only make two for the dinner service and you must order it by 7:30pm or miss out. Less of a flaky pastry and more of a tart, the custard from the centre of our still-warm-from-the-oven slice gives in to gravity and slowly slides down until it kisses the plate. The pale-yellow filling is on the right side of sweet, its softness converted to crispness on top, dusted with the heady aromas of cinnamon and icing sugar. We scrape every last crumb with our spoons, which, when you consider that CS always leaves custard in the corner in favour of cream or ice cream, is a runaway victory. At the time of our visit, we were debating where to catch some late September sun; Lisbon became the frontrunner after our teeth sunk into that butter-loaded bread. If this understated taberna is a snapshot of what to expect from this colourful coastal city, then I might need to take a leaf out of Chiltern Firehouse’s glamourous clientele’s book and hire a post-trip personal trainer because it’s going to be a food-filled week. Budget: £55 pp (including 12.5% service and 1 bottle of wine). I didn’t know you could serve up pork as tartare?! That’s one brave chef! For me though, it’s that pasteis de nata tart everytime. Have an amazing trip to Lisbon, Seetal!